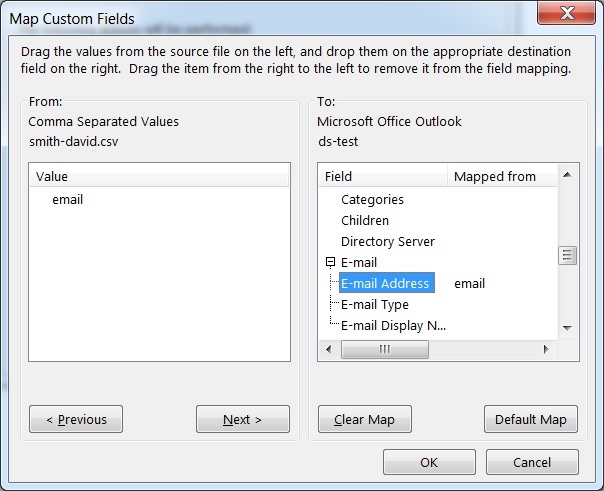 In the following post I am going to explain how to easily and quickly test all of the guesses for a person’s email address all at once using MS Outlook. MS Outlook has an add-on called Social Connector. I have Outlook 2013 and the Social Connector is built in; for this latest version you need to turn it on. For earlier Outlook versions you need to add it which is easily done. 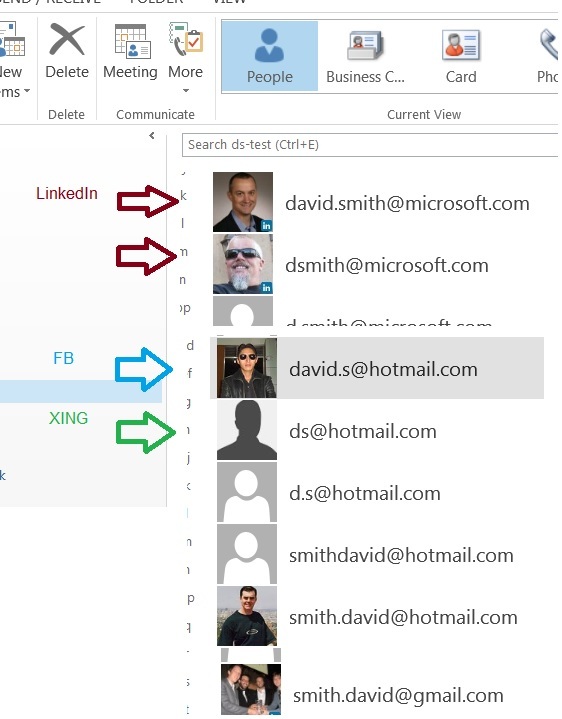 You can then connect Outlook with your LinkedIn and Facebook accounts and (depending on the version) with other social sites. I was able to add XING to my Outlook. Here’s How to Find Almost Anyone’s Email Address. 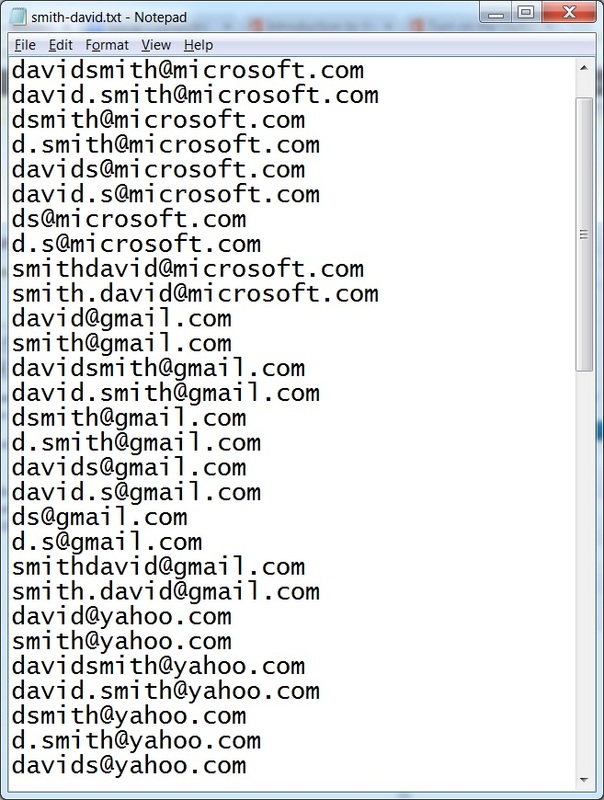 The example below is for a “sample” person with the common name David Smith who works at Microsoft. I am starting off by generating a list of guesses for the email address (or, perhaps, several email addresses) for the person. As a sample list of guesses I am trying variations of the email using @microsoft.com and several free email provider extensions such as gmail, yahoo, hotmail, and aol. Note: These email guesses I am using are not “optimal” for a case like this; you are on your own to set a list of guesses. Ideas and templates are welcome; please share. What I am going to explain is how to test the guesses out all at once. Step 3. Here is what the list look like after importing. You can see the email addresses that have been identified on each of the networks! The identified LinkedIn profiles stand out, having a little blue “in” on the pictures. Your being connected with the people with the given addresses doesn’t affect the identification; it always works; or let’s say, it works the same for everyone. Have you read the post up to here? 🙂 Here are a couple of notes on relevant previous blog posts that you may have thought of. 1) Correct, you know how to find email addresses using Rapportive. It’s explained in the great post Find (Almost) Anybody’s Email Address | Distilled along with an excel table that helps to generate a list of guesses for the email addresses at bit.ly/name2email. – it looks the email addresses up vs. looking up in the acquired data (as Rapportive does). This is more up-to-date, which can make a difference in better identification of the email address. – it shows the whole list at once; you can have a list as long as you wish. If the list is long, you just scroll the list, there’s no need to mouse over every address. This is much faster. If someone is not on LinkedIn and not on Facebook, but is identified by Rapportive, the referenced post would work better; if you are really after an email address, try both! 2) Great! You have read my most popular to-date post Find Almost Anybody’s Email Address with #LinkedIn. – it will also find people who are on other social sites, most importantly, Facebook. Thank you gain. It is working fine with me. I am also using office 2013 but how can I add Xing to it? Thank you Glenn. It is working better than rapportive. 🙂 Also I just added Xing to it. A useful thing to know about gmail is that it ignores periods. For example, john.smith@gmail.com is the same as johnsmith@gmail.com and j.oh.nsmit.h@gmail.com. You can also put a plus (“+”) sign and any combination of words or numbers after your name, like changing hikingfan@gmail.com to hikingfan+mailinglists@gmail.com or hikingfan+junk@gmail.com. Then you can easily add a filter to label and/or archive messages sent to the variations. The second thing is a great way to see which places are selling your email to spammers. Interesting and informative, as always. Is there something similar for Lotus Notes? Will this work for the Outlook version in Mac for Window?